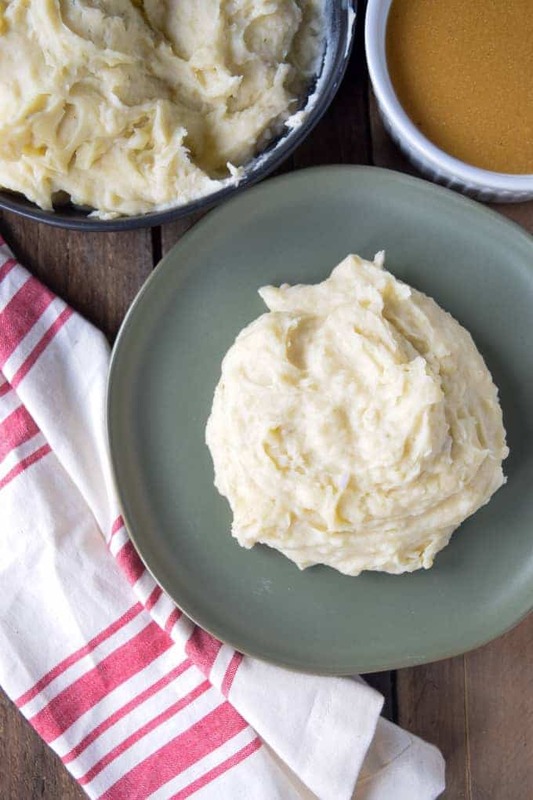 Forget all those other mashed potato recipes with “fancy schmancy” names. 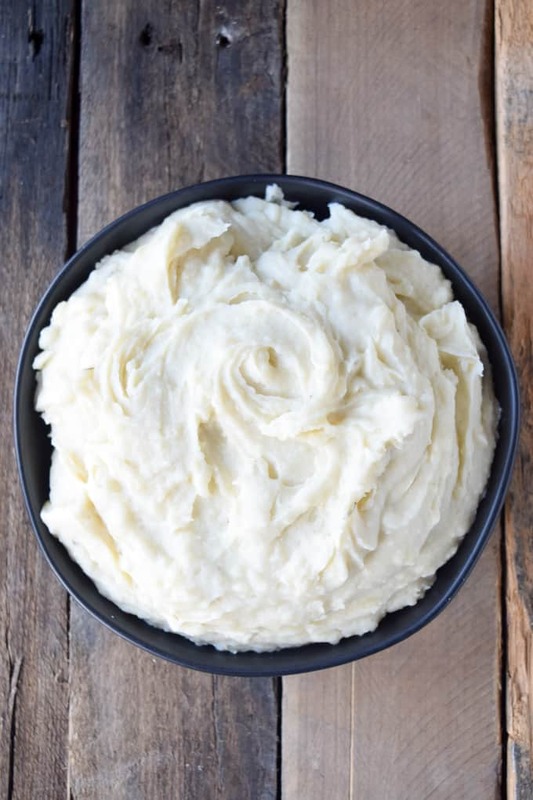 It’s time to make this Boss of a side dish: Creamy Homemade Vegan Mashed Potatoes! Yeah, I could have thought of cooler name for this recipe, but nobody gives a rat’s @$$ about the name. It’s all about taste, baby! And, as an added bonus, serve these at any gathering where there’s people you don’t like and they’ll be so busy eating you won’t have to engage in all that meaningless small talk you hate. Which means, this is the perfect food when all the family is in town for the holidays. You’re welcome! 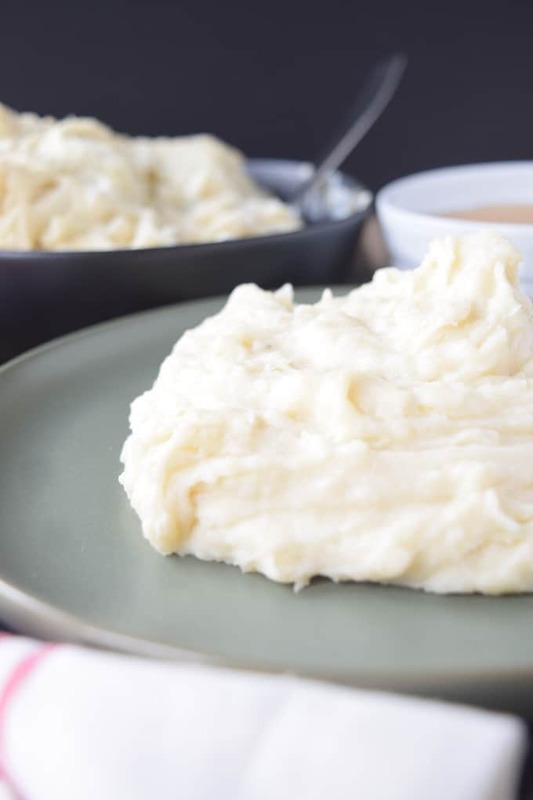 CREAMY HOMEMADE VEGAN MASHED POTATOES – Protecting you from awkward, irrelevant conversation at even the most dreaded get-togethers. That being said, LET’S DO THIS! 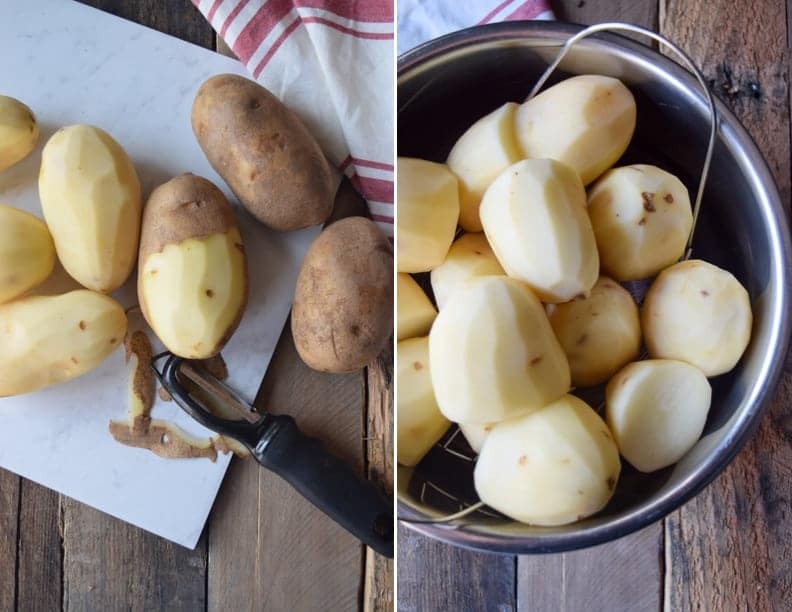 I like to peel the potatoes and steam them in my Instant Pot. In 13 minutes I’ve got perfectly steamed potatoes. What’s the secret behind these creamy little devils? Two things: My Cashew Sour Cream and my KitchenAid mixer. 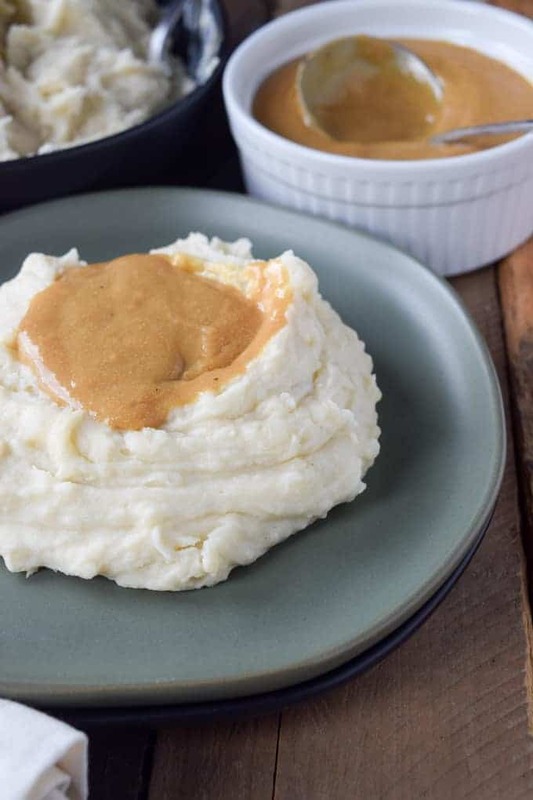 The Cashew Sour Cream adds the tanginess and creaminess you love in mashed potatoes. And, the whisk attachment for the KitchenAid whips the potatoes unlike anything you’ve ever seen. Next to my Vitamix, the KitchenAid mixer is one of those “must haves” I must have. I shudder to think what my kitchen would be without either of them. If you don’t have a KitchenAid or handheld mixer, looks like you’ll be doing it old school with a potato masher. Big deal! You’re grandmother did it that way and she never complained. And, I bet her potatoes were pretty damn good! What you have after just a few minutes of whisking and waiting is a bowl of absolute perfection. 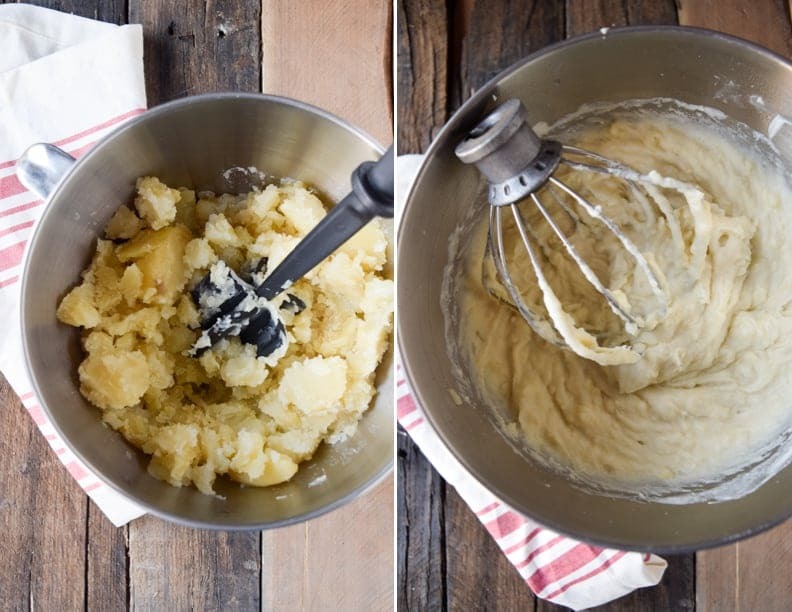 If you want your potatoes smoother, whisk them longer. If you want them lumpier, don’t blend as long. Oh, before I go, I have one more surprise for you. How about some gravy for these taters? Yeah, I know. I just give and give and ask for nothing in return. What can I say? I love you. You can find the recipe for my Easy Vegan Brown Gravy right here. And, I don’t think you’ll be disappointed. If you make this, and I hope you will, leave a comment. Then, take a picture; post it on Instagram; and, tag the photo #shaneandsimple because I want to see your creation. I really do! 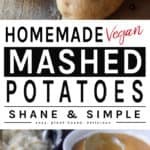 It’d also be really great if you would SUBSCRIBE to Shane & Simple…it’s free! Really! 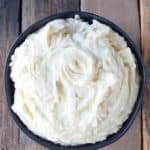 Creamy Homemade Vegan mashed potatoes made with my Cashew Sour Cream. Super creamy, simple to make, healthy, and absolutely delicious. Peel potatoes (or not if you prefer to leave the skins on…totally acceptable), and roughly chop into small chunks. Place in large pot and cover with water. Bring water to boil then reduce to medium-high heat and gently boil for 10-20 minutes, or until tender enough to pierce with a fork. 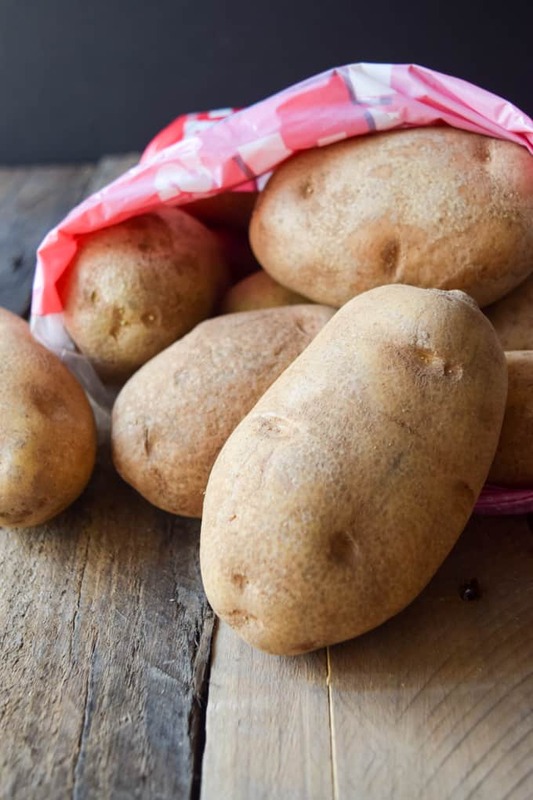 When potatoes are done cooking, drain water and add to the bowl of your KitchenAid or stand mixer. Lightly mash with potato masher. Place whisk attachment onto mixer, add all remaining ingredients to potatoes, and whisk for a couple minutes for lumpier potatoes. For smoother, creamier potatoes whisk a little longer until you reach your desired consistency. Top with Easy Vegan Brown Gravy and crush like a boss. You can leave the Cashew Sour Cream out to reduce the fat and they still taste great. You can also use my Easy Vegan Tofu Sour Cream as well. Are there any other “sour cream” to substitute? I like in Hong Kong. Cashew sour cream would be way too exotic, even for expats here. Sure thing, Paul. A couple of things: 1) You can leave the cashew sour cream out altogether, the potatoes are still good. 2) You could use a tofu sour cream. Here’s the recipe: 12 oz. of firm “silken” tofu, 1 tbsp. apple cider vinegar, 1 tbsp. lemon juice, 1 tsp. salt. Blend everything together until it’s smooth. Hope this helps! When you prepare your potatoes in the instant pot for 13 minutes, do you use the 10 minute manual release method or ? I’m going to make your meatloaf, mashed potatoes, creamed corn, and gravy! That’s just the beginning of your recipes I’ll be making. I can barely wait to get started!!! Awesome, Becky! So pumped you’ll be making these. Honestly, concerning the Instant Post, it’s different every time. If I’m in a rush, I’ll manually release as soon as the beeper goes off. Or, if it’s a pretty chill day and planned ahead, I’ll let it manually release. Hope that helps:) And, be sure and let me know how everything turns out. Blessings! Yes it does:) I will keep you posted! How do you do the instant pot? Do you put water in the bottom? Use a steamer basket? Any tips would be appreciated. Thanks! I use a steamer basket with 1 cup of water and set to steam for 12 minutes.